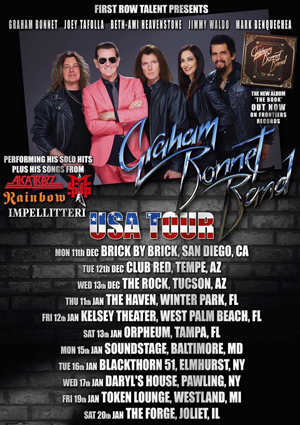 The GRAHAM BONNET BAND has announced tour dates for the US for late 2017 and early 2018, making this the most extensive US tour Bonnet has undertaken since 1986 (as a member of ALCATRAZZ). The band will be performing all the songs people know from Bonnet's history with RAINBOW, MICHAEL SCHENKER GROUP, ALCATRAZZ and IMPELLITTERI, as well as his solo hits in a show that runs for nearly 100 minutes. The GRAHAM BONNET BAND recently announced Joey Tafolla as their new guitarist, effective immediately Joey will be joining the band for all upcoming tour dates and the recording of a new GRAHAM BONNET BAND album, the follow-up to last year's The Book release. Joey Tafolla began his career as a member of the 80s power metal band JAG PANZER. After achieving cult status for the band's first full length LP, he recorded solo instrumental CDs with legendary label Shrapnel Records, a label responsible for breaking such talent as Paul Gilbert, Tony MacAlpine, Yngwie Malmsteen and Richie Kotzen to name just a few. Graham Bonnet performs next on November 2nd as part of Michael Schenker Fest at O2 Shepherds Bush Empire in London, England.